Whether you're looking to come face to face with molten lava or kaleidoscopic sand, you won't have trouble finding ways to pass the time on the Big Island. Frommer's writes, "Where else can you witness fiery creation and swim with dolphins, ponder the stars from the world's tallest mountain and catch a blue marlin, downhill-ski and surf the waves in a single day?" 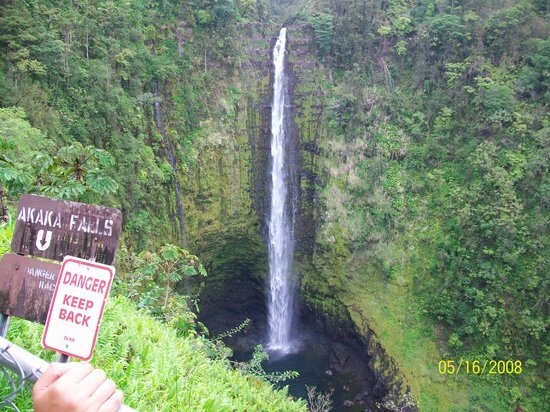 Hilo's Akaka Falls State Park is a short, low-intensity hike in northeastern Hawai'i. Its payoff comes in the form of two consecutive waterfalls -- cascading Kahuna Falls and the spectacular free-falling Akaka Falls, which earned the park its name. Those who've hiked the flat, paved trail say it's more of a "walk" that's easy enough for just about anyone -- even young children. You'll most likely be able to make the loop through the park in less than 30 minutes, and considering Akaka is a free, short-on-time experience, travelers suggest it's one you can't miss. You can expect to hear one question above all others if you tell people you're planning a visit to Big Island. "Are you going see the Volcano?" "The Volcano," as it were, loosely refers to two active volcanoes in the Hawai'i Volcanoes National Park; specifically, it's Kilauea that's the real must-see. A 4,000-foot high mountain, Kilaeua has been spitting, spewing and oozing since Jan. 3, 1983 and steadily increasing Hawai'i's land mass on its southeastern side. National Geographic reports that more than 500 acres of new land have been added to the island of Hawai'i since this volcano began erupting 27 years ago. Most people who come to the park hope to see some lava flow; some travelers see a little bit, others find nothing. Check in Kilauea Visitor Center for up-to-date information on trails, safety precautions and where to expect lava flow. Mauna Loa is overshadowed by Kilauea's fame, but not its height -- this occasionally snow-capped volcano reaches nearly 14,000 feet and is the largest volcano on Earth. Exploring Kilauea will probably eat up much of your time and energy, but don't worry; majestic Mauna Loa is clearly visible and picture-ready in much of the park. Stop to snap a photo from afar even if you don't get up close and personal. Many choose to spend several days hiking in the park, visiting the Jaggar Museum (where you can learn about volcanography and seismographs), or trekking the Chain of Craters Road (where 2003 lava flow naturally dead-ended a paved road). But if you only have one day, opt for the three-hour hike or 11-mile drive along Crater Rim Drive. You'll pass by the Kilauea caldera and through a magnificent rain forest, enjoying the park's unique vegetation. One thing to skip in a time-crunch: The Thurston Lava Tube, also on Crater Rim Drive, which is almost always overrun with tourists, too cramped and too dark to really enjoy. The Hawai'i Volcanoes National Park is open all day and night year round. Admission to the park costs $5 per person or $10 per vehicle and is good for seven days. You'll find the Kilauea Visitor Center on Crater Rim Drive, south of Hilo off Highway 11. It's open daily from 7:45 a.m. to 5:00 p.m. The Jaggar Museum is open daily from 8:30 a.m to 7:30 p.m. Visit the park's official website at www.nps.gov/havo/index.htm for more information on operating hours, entrance fees, safety precautions and nearby places to eat. Waipio Valley is historically significant to the Hawaiian people. It was once one of the most fertile valleys on the Big Island and the home to an estimated 10,000 people when the navigator Captain James Cook first arrived in 1778. It was also home to Kamehameha the Great and many other Hawaiian rulers, earning it the nickname "The Valley of the Kings." Now, Waipio Valley is regarded as a modern-day Garden of Eden. One-mile wide, more than five-miles deep, and encased by verdant cliffs that climb up 2,000 feet, the valley is best beheld from an overlook point on its southern side. You can also enjoy Waipio's scenery on a van tour, a strenuous hike (you'll have to make a steep descent into the valley) or by horseback. There's a black sand beach, as well, but the murky water isn't good for swimming. Technically, the Waipio Valley is free to enjoy, but most people visit on a tour. The cost varies dependent on the company you choose and the type of excursion you've opted for; Big Island's tourism site at www.gohawaii.com/big-island has information on some of the most popular companies. Of Papakolea Beach, Frommer's writes, "The place has its problems: It's difficult to reach; the open bay is often rough; there are no facilities, fresh water, or shade from the relentless sun; and howling winds scour the point." We know what you're thinking -- why the heck should you go? It's because of all of Big Island's interesting sand hues, Papakolea Beach's is the rarest. The sand is green. Actual, olive-tapenade green, and travelers can't get enough of it. 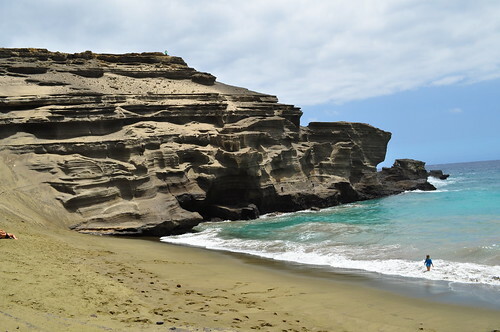 Papakolea is one of two green-sand beaches in the United States (the other one is Talofofo Beach in Guam), so even if you're only going to snap a few photos, it's absolutely worth the trip. Papakolea earned this distinction thanks to the Pu'u Mahana cinder cone (or volcanic fragment) that circles the beach's shoreline and erodes into the sand. Allot at least two hours for an excursion here, time enough to get to this secluded spot -- you'll find a dead-end road in South Point off Highway 11 -- and then to make the two-mile hike or drive to the cinder cone's steep descent to Papakolea. 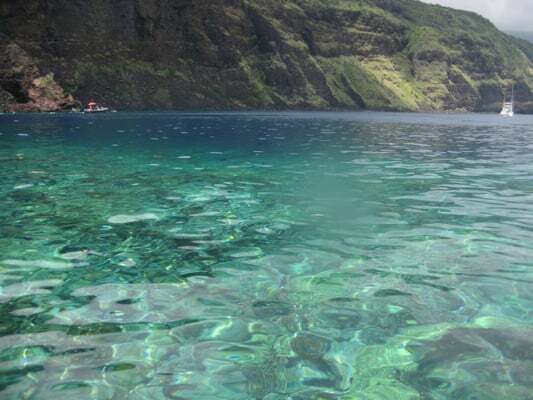 Snorkelers like to visit this remote bay on Hawai'i's west coast for the tropical fish, sea turtles and Hawaiian Spinner dolphins that are plainly visible just below the calm, shallow water's surface. History junkies make the trek to Kealakekua for a different reason altogether. Navigator Captain James Cook first spotted the bay and stayed here as a guest in January 1779. Weeks later tensions rose and he was killed on the very same shore. Take time in between snorkel trips and scuba dives to behold the large white Cook Monument that sits high on a Kealakekua hill. The deliberately named waters of Hapuna Beach -- Hapuna means "spring" or "pool" in Hawaiian -- are probably the most loved on all of Big Island. Both visitors and residents flock to this beach on the Kohala coast, and encourage you to do the same. If you're not visiting for the soft-as-cotton sand, then you've probably come for the aquamarine water. And if you aren't enjoying the aquamarine water then you've probably come for the not-to-be-believed sunsets. Hapuna Beach's famously calm waves are really only famously calm for part of the year; in the wintertime the tide might be too rough for swimming. And this beautiful beach is understandably crowded much of the time, but doesn't have concession stands or beach-side restaurants. Still, recent travelers are more inclined to point out Hapuna's positives: There's almost always a lifeguard on duty, which is invaluable when the tide is high; there's plenty of parking, which isn't the case at Big Island's other popular beach, Kaunaoa; and you'll find plenty of picnic benches and restrooms.